Every morning our staff begin the creation of a wide range of quality handmade chocolates to be sold in our Tearooms. Each Individual Chocolate within this ‘Gift Box’ is handcrafted, therefore no two boxes of chocolates look identical. Each box is unique, due to the pouring technique applied to the swirl background. A memorable gift for any special occasion, interstate or international visitors. Our hand-packaged gift boxes contain a vast array of quality handmade chocolates. When you become a ‘Chocolate Drop In’ why not make up your own selection of your favourite Handmade Chocolates, they make terrific corporate gifts or a special treat. A perfect selection for family or friends, these can be gift wrapped too! Yanchep National Parks unique Cabaret Cave is the perfect venue for your special day. Chocolate Drops provides quality handmade wedding chocolates exclusively for weddings/receptions held within Yanchep National Park. Personalised handmade chocolates for your Bridal Table and your individual guests. Quality handmade chocolates that will compliment your special day, such a unique service. Create your individual collection of quality handmade chocolates incorporating themed Australian chocolates (wombats, koalas, kookaburras, frilled neck lizards, boomerangs and bilbies) or select from our range of ‘Nuts about Chocolate Drops’ walnut wonders, cashew swirls, peanut clusters, coconut roughs, almond slivers and rocky road. Your Chocolate Drops ‘showing off bag’ is just waiting to be filled from our mouth watering selection!! 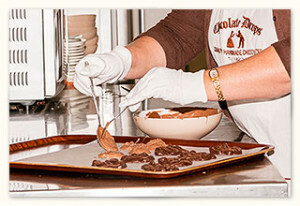 Chocolate Drops have members of staff who have repeatedly entered the Royal Perth Show – Creative Craft Chocolate and Confectionary Category – Winners in 2004, 2005, 2006, 2007 and 2008. We are very proud to combine chocolate products from our chocolate sculptures designed for the Perth Royal Show exhibits within our very own ‘showing off bags’. Designed to compliment any theme, these freckles can be personalised with a hand-decorated message and moulded chocolates that capture the very chocolate essence of your occasion. Such a combination to choose from! Personalised hand-decorated themed chocolates for fund-raising activities, corporate events, club or association raffle prizes or created as a gift for any dinner party. Add any chocolates that are available from our product range to enhance the occasion. Wonderfully gift wrapped at no extra charge.